Our facility has grown substantially over the last few years. 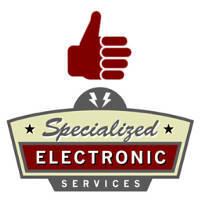 Specialized Electronics is now at 10890 Alder Circle in Dallas Texas. We have expanded to 9100 sq. ft. in our repair department in Dallas Texas. We have expanded our sales department as well. While our offices are in Dallas we will travel anywhere in the United States and in some areas outside the USA. At Specialized Electronic Services we strive to have a clean and safe work environment to help us make sure to have the best possible conditions to work in for repairing your equipment. Customers are encouraged to stop by and see our state of the art facility. Our front office area also includes two conference rooms for meetings and training. We even do seminars on AC drives and DC drives at our facility. We have upgraded our facilities so that we are able to help our customers more efficiently and in a pleasant atmosphere. We do load testing on AC drives, DC drives, Servo drives, VFD’s, and power supplies at our facility. At Specialized Electronics we don’t have to outsource your repair to the manufacturer like many of our competitors do because we can repair down to component level and test your Industrial Electronic Equipment here in our building. All of our representatives have upgraded telecommunications equipment so they can assist any customer. See below to see some of the features of our new facilities. Training Services: SES also offers training for our customers, either at our facilities or at your location. We can provide training on your exact equipment so that your maintenance staff can be more self-sufficient, able to decrease downtime by quicker diagnosis of failures. We can offer training on your systems as a whole, or go into whatever level of detail on the specific components of your system that you, the customer, require. We have two conference rooms at our site for training if you wish to be trained in a classroom type setting. We also offer training at the customer’s site where we can take the class directly to your specific equipment, so the students can get the “real” feel for how to trouble-shoot and maintain their actual equipment. We recommend keeping our classes to 4 students or less so we can maintain a high level of learning. We find this keeps the students attention and they are more willing to ask questions. This also enables the instructor to work with each student individually. Our customers are encouraged to stop in when in the Dallas area, and visit with us and tour our operation. Specialized Electronics is a 24 hour service company with the office being open from 7:00 A.M. to 5:00 P.M. Monday through Friday. We will also open up on the weekend for a customer at a premium. In our repair services area, we have a state-of-the-art technicians lab. Here we have a loading test station for testing AC and DC drives, as well as power supplies. These items are tested from a remote control panel at an amperage capacity to simulate the actual conditions at your facility. This ensures a greater degree of accuracy in the assessment and repair of your equipment. We have the capability to do load testing up to 100 HP on drives and 200A power supplies. We can also simulate loads on much larger HP drives. Each technician’s bench is equipped with a Huntron 2000 and a DSI 700. This equipment helps us to locate and replace bad or weakened circuit board components. We also have state of the art fluke meters including scope meters, DMM, bench meters and fluke LCR meters. SES has a variety of other test equipment ranging from solder/desoldering stations to 100MHz oscilloscopes. We also have a Power Pad capable of storing data such as current and voltage levels as well as electrical noise and can be put on a computer for you to see what your equipment is doing. A vast rack system stores replacement components and is easily accessible to help in our repairs. Computer Inventory System: Our shipping/receiving office uses computer systems to generate repair quotes and special order components. Our computer inventory system enables us to track each customer repair order from receipt to completion. We store electronic components and refurbished items for sale in our large warehouse. Items to be repaired are received and assigned a tracking number in the adjacent shipping/receiving room. This is also where we do all our packing of repairs and purchases. The floor is coated with ESD wax and each item is packed with anti-static shrink wrap and/or bubble wrap and/or foam peanuts.